This medicine chest is nearly 100 years old and was initially placed on board a steam trawler in the ownership of Scarborough’s most prolific trawler owner, James (Jim) Johnson. His trawling business ‘J. JOHNSON & SON ~ Fish Salesman, Trawler Owner and Agents’ was at 10 Quay Street, Scarborough, and commenced in 1915. Jim Johnson’s Grandson, J Martin Johnson, presented the medicine chest to the Scarborough Maritime Heritage Centre. 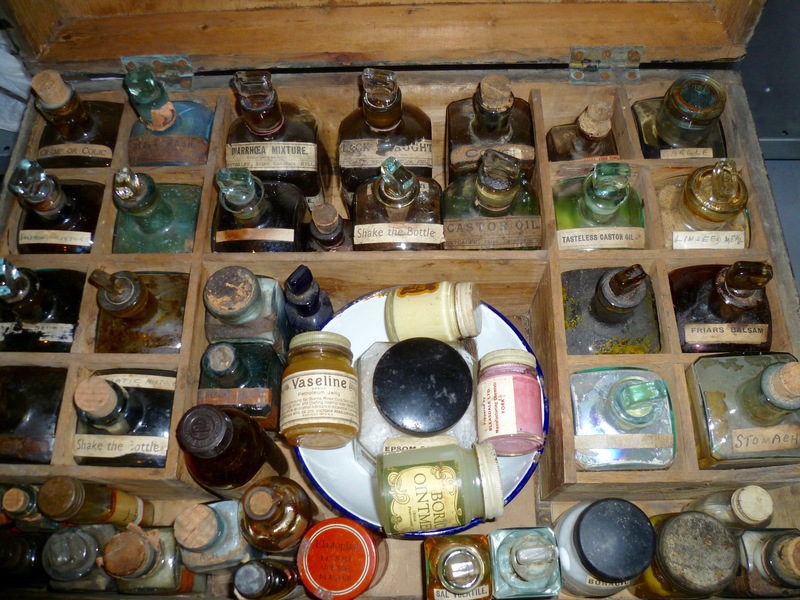 The contents of the chest are still complete and contain many 1950s and original bottles. 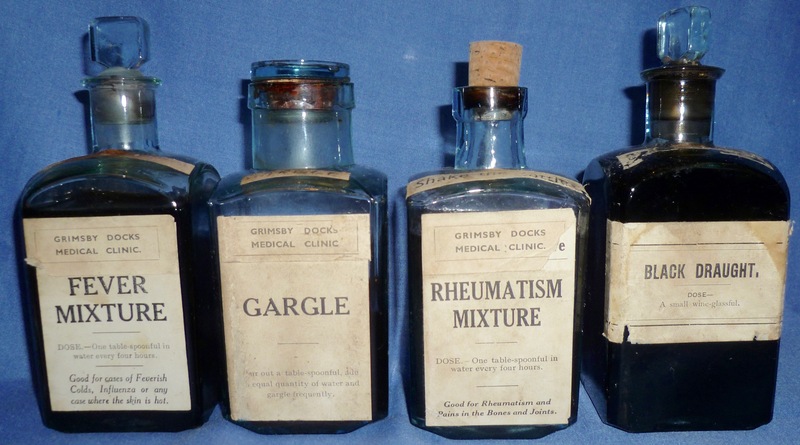 The actual contents of them is largely unknown except for the titles on the usage labels. When men were at sea, far from a doctor or help, this chest was the only help available. A rudimentary first aid guide is pasted in the lid along with splints, bandages and eye patches in the lower drawer. Fishing was and still is one of the most dangerous working environments. Wet decks, heavy seas, strong winds, taught wires and ropes, cold hands and sharp knives can all lead to injury. If none of the medicines in the chest resulted in a cure and the patient died, then to enable the trawler’s skipper to perform religious rites over the deceased a miniature Holy Bible is included. This bible is very hard to read even with a magnifying glass. It is only 35mm tall x 25mm wide x 10mm thick. 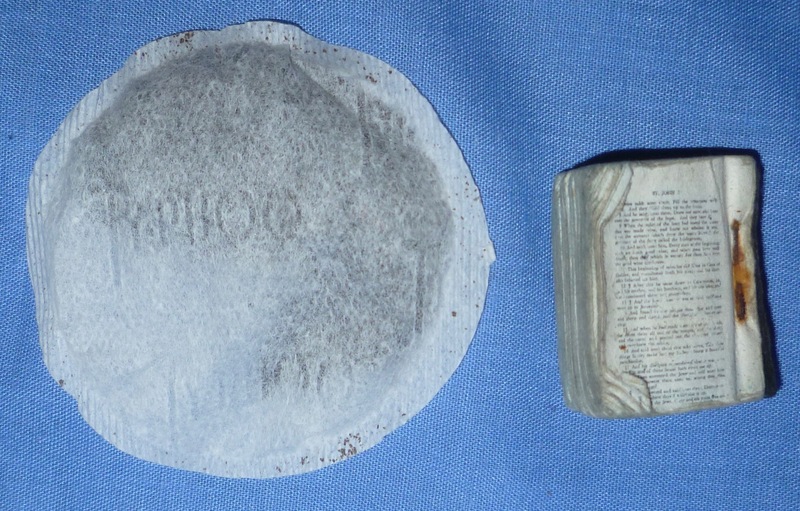 (The photograph shows it next to a standard teabag). The purpose being that it is something tangible for the skipper to hold whilst addressing the body. It contains a part of the Old Testament, commencing with the entire Gospels of Matthew, Mark and Luke but terminating at Chapter 2, Verse 20 of the Gospel of St. John. Tasteless Castor Oil Stomach upset. Diarrhoea Good for diarrhoea & derangement of bowels. Black Wash External use only. Soothing Mixture 1 teaspoon in water, good for sleeplessness and irritability. Purging Pills Use your imagination. Blood & Stomach Pills Precise purpose not clear. Black Draught ‘A small wineglass full’. Purpose unknown?